This is a difficult post for us to write, but we do so with the hope that other parents can learn from it. A little wisdom shared can go a long way. It all started with a simple oversight and good intentions for a day outdoors with the kids. If you flip through our book Outdoors with Kids New York City, or through a number of our Kids.Outdoors posts, you will see that our children, Riley and Halina, are often in helmets. This is in some part because they ride scooters or bikes just about everywhere. In New York State, helmets are required for bicyclists under the age of fourteen, but they are not for adults—nor are they required for other children’s activities like ice skating or sledding. Still, we usually insist that we all wear helmets on these kinds of outings. It’s been an unseasonably warm winter, so when the first significant snowfall finally arrived, all we could think about was sledding. We spent too much time hunting for the gloves, scarves, winter boots, and snow pants that we hadn’t yet worn this season, and in the frenzy to find it all and get out the door with the sleds, something was bound to get left behind. Despite being sticklers about safety, we forgot the helmets. We remembered them as soon as we were outside and on the hill at 116th Street in Riverside Park. The hill was packed with sledders, and only one toddler was in a helmet. Maybe wearing helmets for sledding is something children outgrow, we thought. We certainly hadn’t worn helmets when we sledded as kids, or when we went ice skating or rode bicycles or skateboards. The odds were good that they’d be just fine. And that day, we were right: we had a glorious time, totally without incident. The next day we headed up to another legendary city sledding landmark: Inwood Hill Park in northern Manhattan. We took the subway up, but as soon as the doors slid closed, we realized something was missing. Since the kids had sleds to carry, they didn’t ride their scooters. And since they didn’t ride their scooters, they weren’t wearing their helmets. We groaned and decided that from then on we’d be better about remembering them. At the sight of the incredible hill and scores of kids bombing down it, Riley and Halina hopped right on their sleds before we even reached the optimal spot. The night before had been very cold, and the packed snow was much slicker than the soft fluff they’d ridden in Riverside Park the day before. Riley is quite masterful on his plastic snowboard and managed the conditions well enough. But Halina, who was laying on her stomach on her plastic sled, lost control near the bottom of the hill and hurtled headlong into a park bench. We were running down the hill before she even reached the bottom, phone out and 911 on the line as we reached her. She sat up with a two-inch long gash on her scalp. She did not lose consciousness, but she was understandably sobbing. We hugged her and held her and it was all we could do to maintain composure, which we knew was better for her sake. The ambulance arrived quickly, and Halina was calm by the time they’d wrapped her wound for the ride to the hospital. 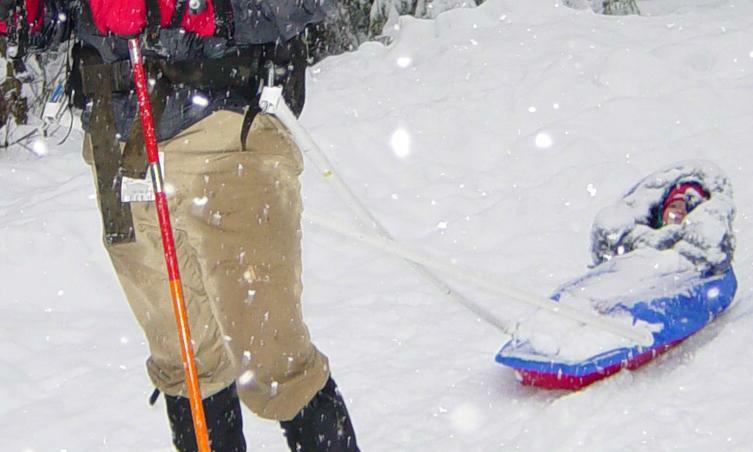 The paramedic, who had 23 years on the job, said, “With all due respect, it amazes me that helmets aren’t required for sledding. I’ve seen this accident so many times before, and look out there—not a single kid wearing a helmet.” Point well taken. Our lessons for the day were not yet over, though. It was the height of flu season, and the emergency room was packed. Since Halina’s injury was not truly serious, we would be seen by the doctor in the order of arrival. At a big city hospital on a Sunday afternoon, this translated into a 10-hour wait. Whether we’re packing for an all-day excursion with the children or just a few hours of skating, we usually pack snacks, lunch, and beverages. On this particular Sunday, we had planned to go for a late lunch after sledding, so we hadn’t brought any provisions. The hospital did not have an onsite dining facility or even a vending machine in the emergency room. The nearest food was across the busy street at a bodega. Given the situation, this wasn’t an option, so we just waited. Note to self: Always have a couple of granola bars on hand. By the five-hour mark, we were really hungry. We finally managed to get some sandwiches for a late dinner, but the doctor didn’t see Halina until 10 P.M. Unfortunately, our ordeal was not yet over. We still needed to get home. We hardly ever carry cash—who does nowadays?—but in the neighborhood surrounding the hospital, yellow cabs that accept debit cards are few and far between. A line of cash-only livery cabs waited at the front door to whisk people away, but that didn’t do us much good. Neither the emergency room nor the main hospital lobby had ATM machines. We were again instructed to go across the street to the bank, but we weren’t about to take our tired and bandaged-up daughter across four lanes of traffic at that hour. Note to self: Always bring some cash! Ultimately, a livery driver offered to take us home without charge. “I’m sure you’ll do something kind to someone else one day,” he said. “It all goes around.” And indeed it does. We’re happy to report that Halina’s wound healed quickly. 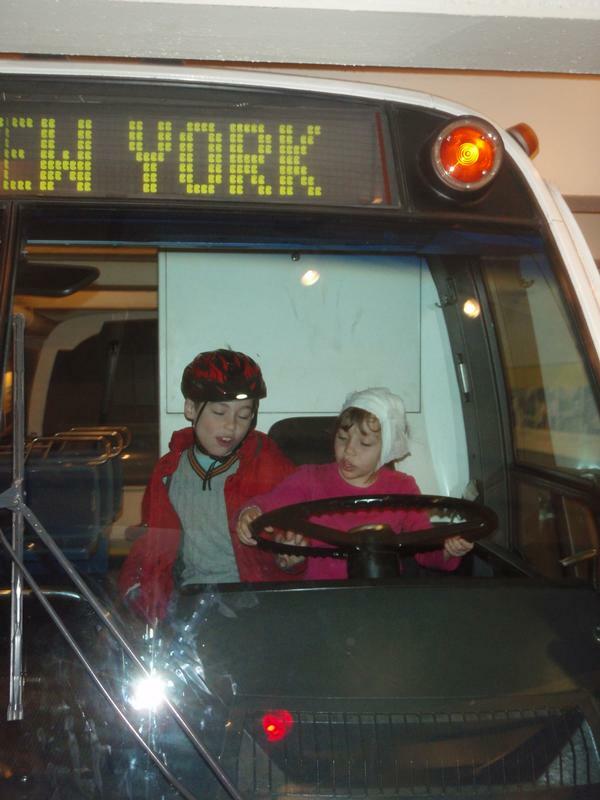 She spent a few days at school and around town (including on a trip to the Transit Museum, which factors into a future post) with her head bandaged for safe keeping, but the attention she got didn’t seem to be half bad. All’s well that ends well, but we certainly won’t rely on the odds when it comes to safety and preparedness, even in the city. And we hope you won’t either.